The goal of Kopf HealthLaw, LLC is to provide high quality personal legal advice quickly and at reasonable cost by drawing on the extensive experience of an attorney who is also a health care professional. The practice provides legal advice to solo medical practitioners, medical groups and networks, nurses, allied health care professionals, medical associations and certain individual patients. 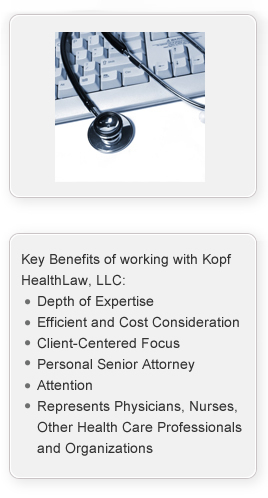 Kopf HealthLaw strives to resolve client matters in an efficient and equitable manner without resorting to litigation. Ms. Kopf applies her health care background when advising clients who have concerns regarding their practice matters, such as incorporation, employment matters and compliance issues, as well as many other legal issues related to the practice of health care today including e-health matters. Her practice extends into the e-health arena as the use of the Internet and other electronic communication media and devices expands the reach and abilities of her clients’ practice as well as their legal liabilities. Ms. Kopf monitors Federal and State health care legislation such as the new Health Care Reform Affordable Care Act legislation, Stark, HIPAA, the HITECH Act other compliance, privacy and security guidelines, Fraud and Abuse, Medicare regulations and is able to evaluate these laws and their impact on the practice of medicine, nursing and allied health fields. She has a reasonable and practical approach when assisting her clients in compliance with the many laws and regulations that apply to health care practice today. She has broad experience with hospital employment and managed care organization matters such as contract review and negotiations. Kopf HealthLaw is also dedicated to providing legal assistance to individuals who are involved in a conflict with their managed care plan, health insurance carrier or Medicare concerning a denial or provision of appropriate and necessary medical services.